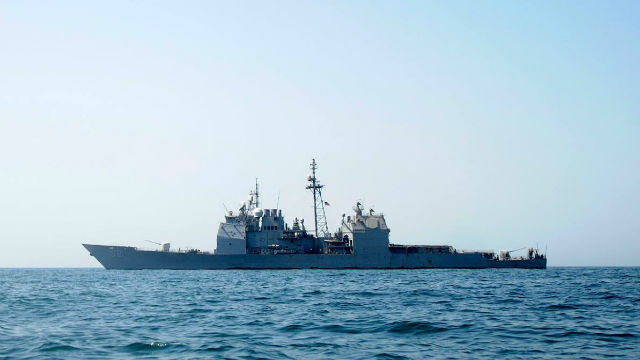 The guided-missile cruiser USS Bunker Hill is scheduled to return to Naval Base San Diego on Monday, the Navy announced Thursday. The ship left San Diego On Oct. 7 for a seven-month deployment with the Theodore Roosevelt Carrier Strike Group and participated in Operation Inherent Resolve, the continuing battle to defeat ISIS in the Middle East, as well as the ongoing mission in Afghanistan. Shortly after beginning the deployment, the Bunker Hill took part in the three-carrier show of force off North Korea involving the USS Theodore Roosevelt, USS Ronald Reagan and USS Nimitz. The Bunker Hill was launched in 1985 and is scheduled to be decommissioned next year.